Every time the SA government decides to honour a special day, event or icon, they get the Reserve Bank to mint a special commemorative circulation coin – be it a 50c, R2 or even R5 coin. These are the types of coins people would rather store for their uniqueness than spend, the research team at the FSPInvest explain. When that happens, the coin’s rarity factor increases. People start hoarding them and that’s where the potential profit lies. 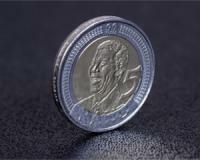 A prime example is the 2008 Nelson Mandela’s 90th birthday R5 coin. If you have one of these in mint condition, you could have the potential to unlock thousands. Take the 2002 Soccer World Cup 50c coin minted in support of Bafana Bafana, for example. These have almost disappeared. But if you have a good condition coin lying around somewhere at home, it’s worth around R320. Then there’s the 2003 50c coin minted to celebrate the South African Cricket World Cup. These sell for as much as R300. And let’s not forget the R2 minted to celebrate ten years of freedom and democracy in 2004. These go for anything from R10 to a couple of hundred rand. A coin’s real value comes down to whether it’s in good condition or not. It’s quite simple really. If there’s a slight hint of wear, but there are no major scratches or marks and the coin still has that ‘brand new’ look, it’s probably worth around 40 times its face value. If there are almost no marks on your coin at all, it could be worth a whole lot more. How do you know? Well, your first starting point is to take a quick look on auction sites like Bid or Buy to see how much coins like yours are selling for. This way, you can gauge how much it could be worth. Next, you need to get your coin valued by a professional coin merchant or numismatist like SA Coin. They’ll help you grade your coin and tell you how much it could fetch on the market right now. So there you have it, South African coins that could make you money.